Since 1992 we have grown our business by making your happiness our priority. We will do whatever is necessary to make sure you’re satisfied with our work & the overall experience. We promise. Our services are geared towards long-term care because we believe in creating lasting relationships with our clients. We treat every home like its our own. We use a “Team” approach with multiple employees per job. So, cleanings are quicker, safer & more detailed than single operator/contractor based window cleaning companies. Hand Trained Employees. No Contractors! Having clean windows can make a huge difference in the atmosphere of your home and it can be an essential element in the appearance of your business. When you hire Steve’s Window Cleaning, there will be no streaks, drips or spots, your windows will be clean and clear! Whether it’s a one time cleaning or if you need your windows cleaned on a regular basis we will get the job done. Satisfaction Guaranteed! Steve’s Window Cleaning has been in business since 1992. 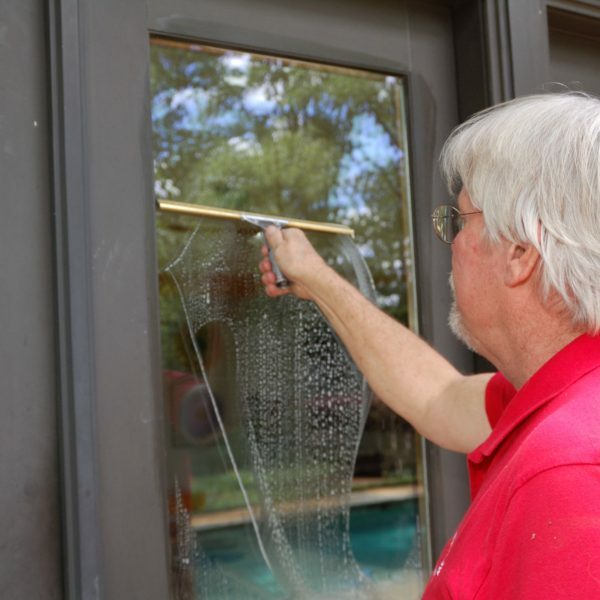 As an established professional business, we understand that you have more important things to focus on than smudges and fingerprints on your windows. Let us take care of your store fronts, office building, restaurant or any other commercial building up to 3 stories. We can help to maintain the appearance of your business with or customizable service program. Regardless of your budget, schedule, or specific needs, we can put a tailored program together for you. Your windows are one of your biggest investments on your home, it only makes sense to keep them clean and well maintained. 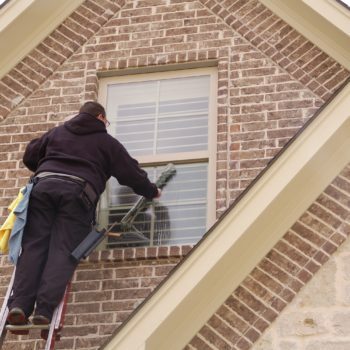 However, trying to clean your own windows can be frustrating, time-consuming, and dangerous. That is where we come in! We are your Tyler Window Cleaning experts. Our technicians have the training and experience to keep your windows looking great, freeing you up to get on with your busy life! With our 25 years of experience we will keep your windows spotless! Whether you have a home with a lot of windows and skylights or a house with a high second story, the last thing you want to do is balance on a ladder while stretching to reach for distant corners. 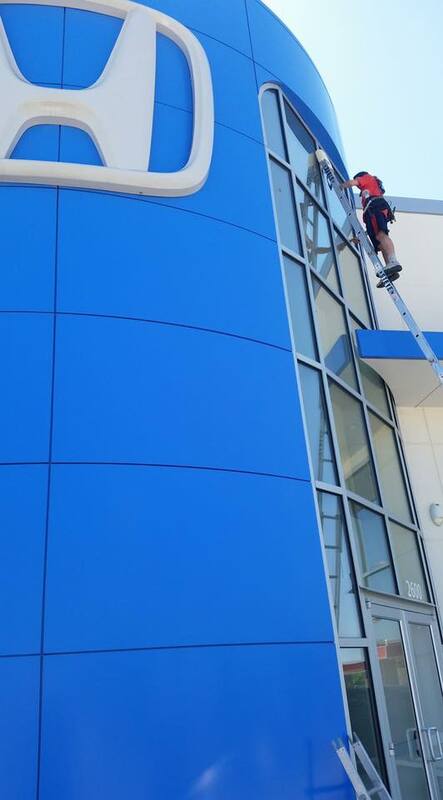 Let our insured and well-equipped crew handle the heights while you stay safe on the ground! If you’re tired of looking at ugly spots and stains, experienced power washes from Steve’s Window Cleaning can make them all go away in the blink of an eye. 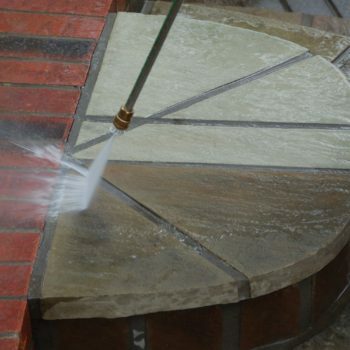 If you’ve never seen power washing in action, the process pushes water through a very small opening to create a high-pressure stream that lifts out stains and washes them away. This process is effective against streaks on shingle roofs, driveway stains, mildew. Although chemicals are not always required, sometimes they’re a useful additive to prevent the growth of mold or moss in the future. Don’t spend thousands to repaint or replace – give us a call and watch your problems disappear! If your gutters are blocked or restricted, even for just one storm, the results can be extremely damaging. Overflowing gutters dump all the rain right next to your foundation, ruining your landscape and leaving you with moisture behind your basement walls. If you’d rather avoid having your basement overrun with mold, the answer is simple! Give us a call today and we’ll be happy to clear your gutters by hand. Don’t hesitate – even if they don’t overflow, the additional weight and moisture can weaken your gutters, causing damage that will require repair or replacement. 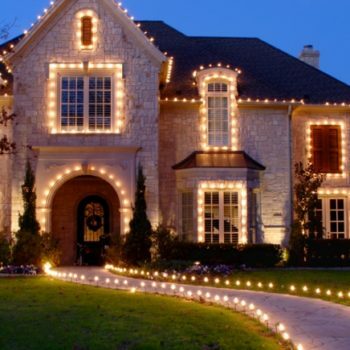 Tired of untangling long strands of lights, trying to figure out which bulb is burned out, or wobbling from the top of your old ladder? With more than a decade of decorating experience, we can give your home a professional look and feel without taking up all your time. Steve does all Commercial Grade c9 LED lights custom fit to your home… we offer by the foot pricing with many colors and styles to choose from, we put them up and take them down at the end of the season, and box them up for you… Moving? Take your box with you and we will fit them to your new house. Whether you’re looking for something that’s simple and clean or colorful and festive, you can consider it done with just one call! We start booking in September every year… don’t miss out Call early and get on the schedule. Schedule Your Window Cleaning Service Now! 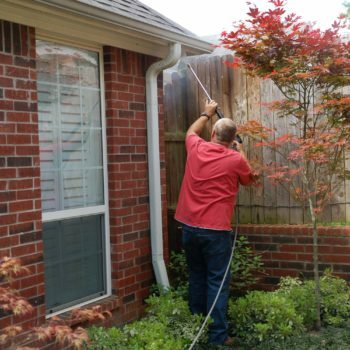 We have been serving Tyler since 1992 and we recognize that pressure washing, gutter and downspout cleaning and window cleaning in Tyler is a competitive business, so we guarantee our work. If you are not completely satisfied with the job we do, our employees will not leave until you are happy. If you’re not home during the appointment, no problem. We will schedule a convenient time and return to make it right. We will always make you happy!